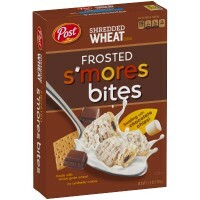 You ended your day camping with s’mores around the campfire, so why not start it with s’mores around the breakfast table? 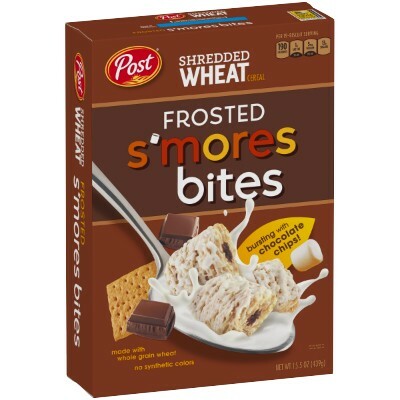 Post Shredded Wheat Frosted S’mores Cereal combines rich chocolate pieces and sweet and fluffy marshmallows with the crunchy and heart-healthy goodness you expect from Post Wheat Frosted Smores Cereal! Whole grain wheat, sugar, chocolate chips (sugar, unsweetened chocolate, cocoa butter, soy lecithin E322, vanilla extract), gelatin, natural and artificial flavors, antioxidant E307 (vitamin E) to preserve freshness, reduced iron, vitamins B9-B3-B5-B1-B6. Contains GMO. Nutrition facts (for 100g): calories 350Kcal, total fat 3.3g (saturated fat 1.7g), total carbohydrate 81.7g (sugar 23.3g), protein 8.3g, salt 0g. je suis une accro des Shredded wheat et cette variété est délicieuse. A racheter !